We are now taking reservation for 2019 mated Mellifera Mellifera queens. £5 deposit is paid to reserve your queen, the balance of £31 will be invoiced when the queens are ready. Please do bear in mind the dates are provisional and the weeks may slip back depending on the weather. As soon as we have information on dates we will email you with an update. The Mellifera Mellifera are often referred to as the European dark bee, they are quite dark in colour and with stocky bodies. 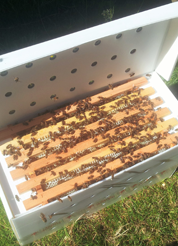 The colonies can build up quite big and the bees are generally quiet on the comb although it is said they run more than other races. The cappings they produce are generally whiter in colour but is also dependent on what they forage on. The brood rearing starts early in spring; they have a lower tendency to swarm and they are very good at defending the nest against pests i.e. the wasps! Apis Mellifera Mellifera are not a race that are inclined to rob its neighbouring hives. They have excellent flight strength even in cold weather with a strong drive to bring in pollen. 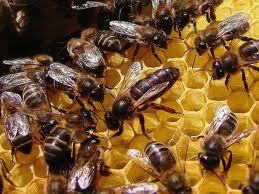 It is said that the workers and queens have a longer life than other races.